A healthy, high fiber breakfast is important but it can also be fun. And waffles are fun. Let’s talk about how healthy they are first. My waffles are made with 100% whole wheat pastry flour and extra light olive oil so… fiber and heart healthy fat. Then I bake each one with a big pile of sliced almonds for extra protein and extra crunch. 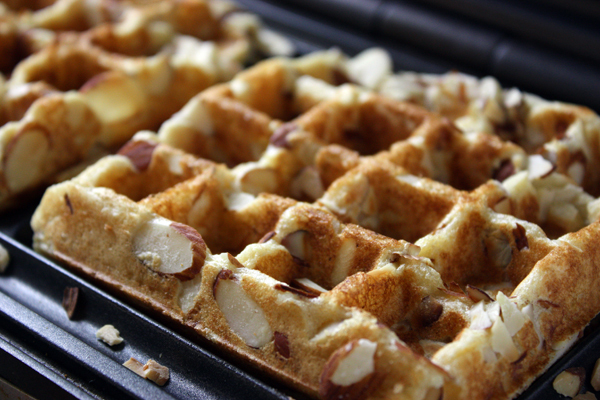 The almonds get baked into the waffle and then you get a fantastic toasted almond flavor with each bite. Oh, and they are easy to make from scratch. Putting the batter together takes less than five minutes! 6 Comments on "Whole Wheat Waffles"
I just wondering if i can use almond flour instead of whole wheat pastry flour. Can I also use apple sauce instead of oil? Thanks for the recipe. I’ve never used either one but I see some recipes online using almond flour so that would probably work. As for apple sauce, I really don’t know. I’ve tried baking with apple sauce and never liked the result. You could try eliminating the oil and increase the eggs but you’re probably better off to find a specific almond-flour waffles recipe. Wow! Those look great!! Definitely buying a waffle iron and trying these.